The longer you wear Yuki Tsumugi, its colors become deeper, and the silken luster more gracefully subtle. Durable and mellow to the touch, material made of this fine silk has the reputation as being the finest of kimono textiles. Yuki Tsumugi is produced in a 20-kilometer (12.4-miles) stretched area along Kinu River, the river of crystal-clear water that forms the border of Ibaraki and Tochigi Prefectures in eastern Japan. Floss silk (made from boiled cocoons that are washed and stretched in lukewarm water, then dried in the shade) is used as it is spun, without being twisted into thread. The extremely fine strands are too delicate for automatic looms, but are woven on unique manual looms. All processes are done by hand, starting with spinning from the floss-silk, creating a pattern on the thread and dying it deep blue, ending with the weaving itself. It can take several months to weave one tan (unit of kimono) (38 cm/15 in. by 10.6 m/11.6 yd.). Yuki Tsumugi has a long history and is mentioned in the literature written in the Nara period (8th century). Among the famous local products presented by Hitachi no Kuni (present-day Ibaraki Prefecture) in tribute to the Imperial Court was the forerunner of Tsumugi, and this is still preserved at Shosoin in Nara. During the Muromachi period (14th to 16th centuries) the cloth was known as Hitachi silk, and became a famous regional product. The local lords of the Yuki family became patrons of the industry and presented the cloth to the Shogun of that period, thus the cloth came to be known as Yuki Tsumugi. Since the beginning, a large number of creative refinements through the whole production process have been handed down through the ages. These days Yuki Tsumugi represent the Pongee of Japan. 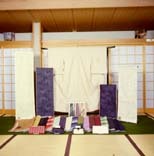 Yuki Tsumugi was designated as an Important Intangible Cultural Property in 1956, and as a Traditional Craft in 1977.